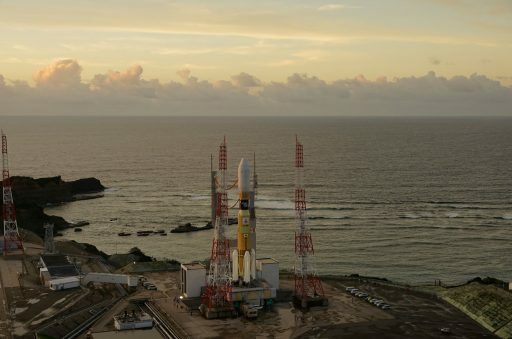 Japan’s H-II Transfer Vehicle is poised for liftoff from the picturesque Tanegashima Space Center on Friday to begin a four-day link-up with the International Space Station to deliver nearly six metric tons of cargo to the orbiting outpost including a set of new batteries that will revamp the Station’s power system and replace a dozen aging battery units. The 57-meter tall H-IIB Rocket topped by the HTV-6 cargo craft will be moved to its sea-side launch pad Thursday evening (UTC) to set the stage for a thirteen-hour countdown to set up for liftoff at precisely 13:26:47 UTC. Climbing uphill with an audible scream and a launch thrust of 1,200 metric-ton-force, H-IIB will be in action for 15 minutes to boost HTV-6 into orbit to catch up with the Space Station for a robotic capture on Tuesday. 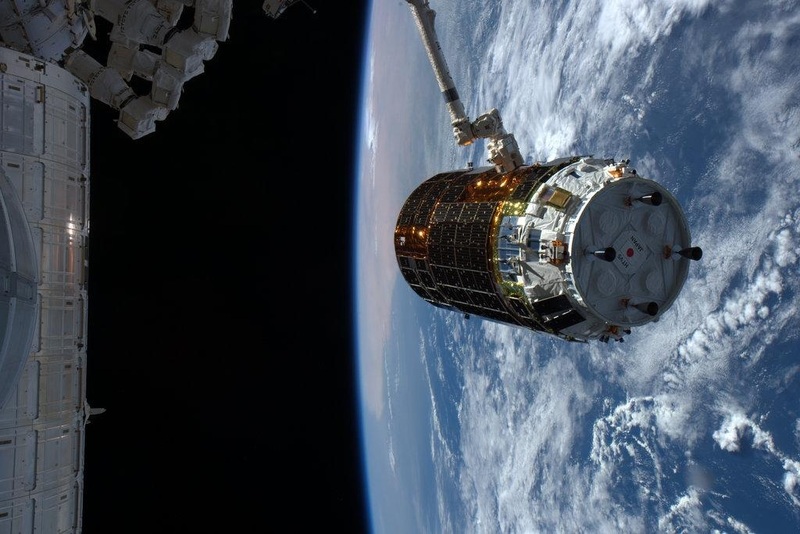 HTV-6 marks an important cargo delivery to the International Space Station, in part due to its Unpressurized Cargo Carrier that allows the craft to bring hefty pieces of external cargo to the Station. In this case, the Exposed Pallet is loaded with six Lithium-Ion Battery Orbital Replacement Units and specially fabricated adapter plates that will allow the new batteries to replace the aging Nickel-Hydrogen battery units that have been in use ever since being launched with the Station’s truss segments in the early 2000s. Four batches of batteries will be delivered by the next HTV missions to replace the Station’s 48 existing batteries – with one Li-Ion battery replacing a pair of the Ni-H batteries. The six batteries delivered by HTV-6 will be installed in an extensive robotic effort and a pair of spacewalks by the station’s crew in early January to end up with six new batteries in place on ISS and nine old ones aboard HTV for disposal while three remain on Station as replacement units. Riding in the pressurized section of the HTV-6 spacecraft is a mix of systems hardware, crew supplies and ISS utilization hardware for a total upmass of 3,900 Kilograms. 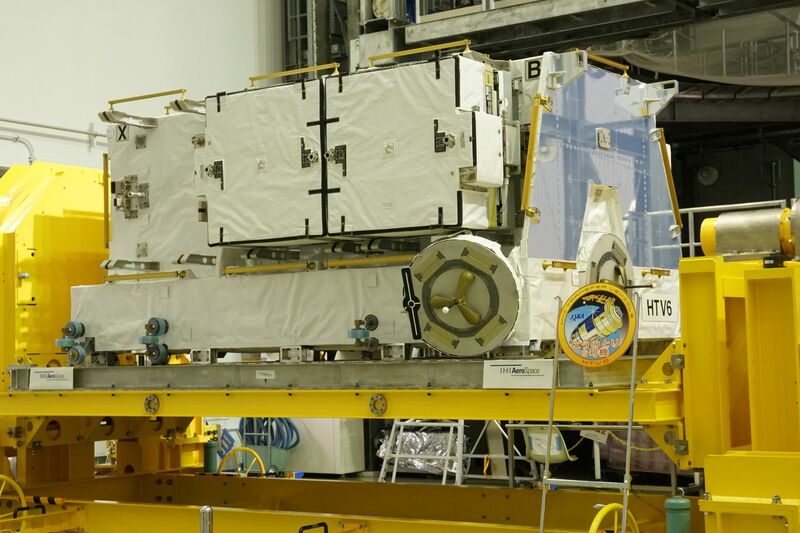 Among the pressurized cargo are water bags holding 600 liters of water, a large replacement component for one of the station’s Carbon Dioxide Removal Assemblies and various replaceable parts as well as crew food and personal crew items. 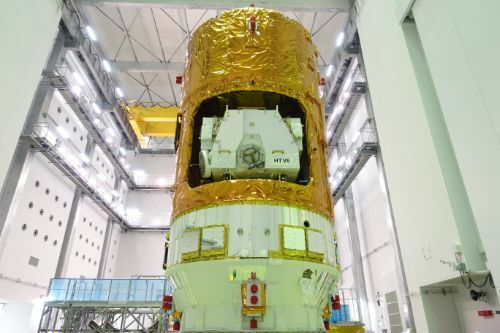 HTV-6 is delivering a Two-Phase Flow Experiment Assembly that will attempt to study the mechanisms of gas-liquid phase transitions in microgravity to develop better models for the design of future thermal regulation systems on satellites and crewed spacecraft. Also onboard is an experimental radiation monitor that aims to objectively quantify radiation exposure experienced by humans in orbit by combining position and energy-sensitive detectors which had not been possible with previous systems. 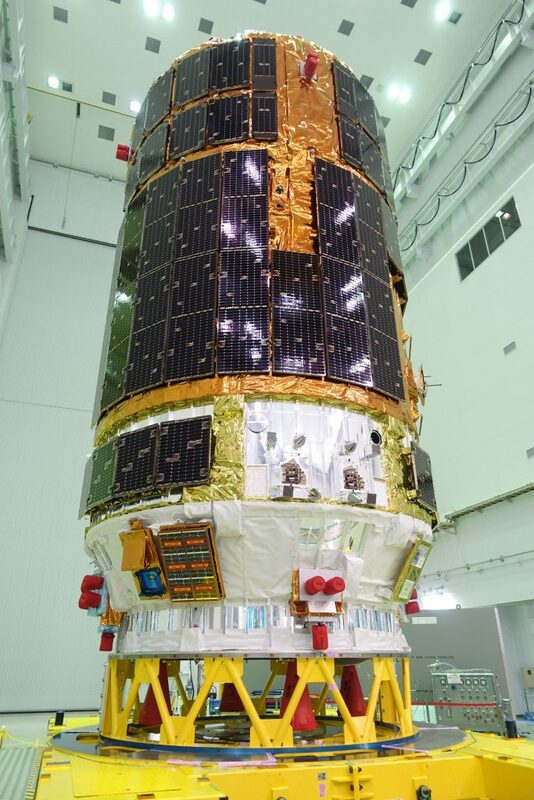 Part HTV’s cargo is an external camera assembly to capture HD and 4K video and still images of Earth and also on board is a new Japanese CubeSat deployer loaded with seven CubeSats that will be released from the Space Station to demonstrate a range of technologies including deorbit sails and flexible heat shield technology. HTV-6 comes over a year after the last HTV visited the Space Station in August 2015 following a launch slip from a planned late summer launch due to a leak on the HTV spacecraft that required repairs and re-testing before launch preparations could be resumed. Gearing up for its cargo-delivery mission, the 16.5-metric ton HTV spacecraft took its spot atop the H-IIB rocket in late November ahead of a period of late cargo loading, possible up to 80 hours prior to liftoff. HTV-6 further pushes the amount of cargo bags facilitated on the HTV with a total capacity of 248 Cargo Transfer Bags, 92 of which could be placed aboard HTV as part of late cargo loading to respond to the cargo needs aboard the Space Station. Buttoned up for liftoff, H-IIB is set for a 400-meter trip from the Vehicle Assembly Building to the rocket’s sea-side launch pad to set up for a period of hands-on work to get H-IIB connected to propellant and electrical interfaces on the ground before teams clear the complex ten and a half hours prior to the planned T-0 time. This marks only the sixth flight of the H-IIB launch vehicle which premiered in September 2009 and has only been flown in support of the HTV program. 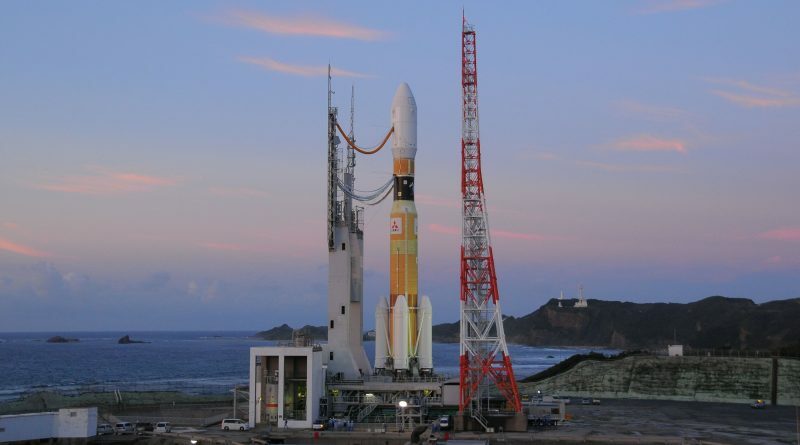 The launcher is operated by Mitsubishi Heavy Industries and consists of two cryogenic rocket stages and four Solid Rocket Boosters, giving it a liftoff mass of 531 metric tons and a Low Earth Orbit payload capability of 19 tons. H-IIB is powered up for a detailed set of flight control checks and attitude control system verifications that have to be satisfactory before the vehicle heads into cryogenic tanking. 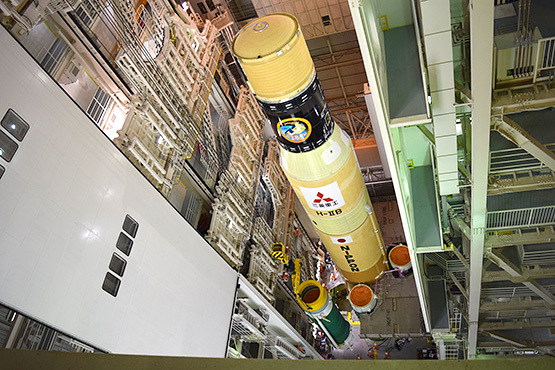 Picking up at X-7 hours and 30 minutes, the three-hour tanking sequence will fill the two stages of the H-IIB with a total of 194,400 Kilograms of Liquid Hydrogen and Liquid Oxygen. 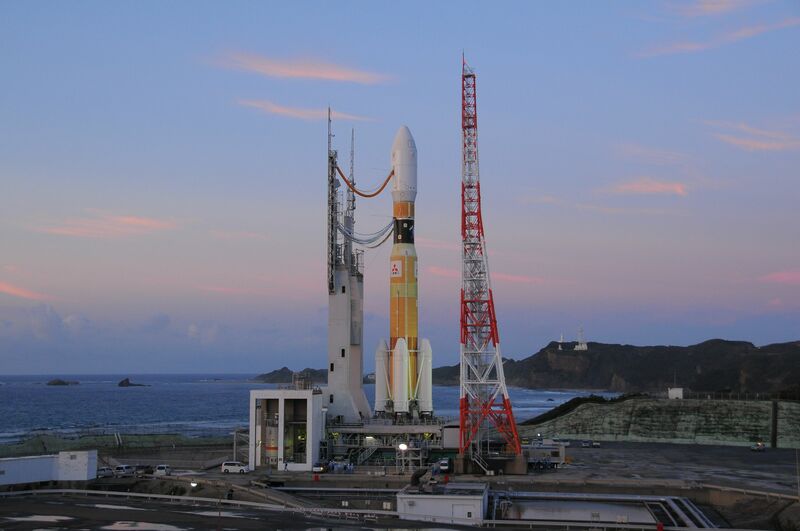 More tests will be run while H-IIB calmly sits on its launch pad with propellants being kept at flight level throughout the countdown. During the final hour of the count, known as the Terminal Countdown Sequence, H-IIB will receive its flight software and complete all preparatory steps for the automated phase of the count. HTV-6 will be passed to internal power before computers assume control of the countdown at X-4.5 minutes. Cleared for launch, H-IIB will begin pressurizing its tanks and switch to battery power when passing X-3 minutes. One minute before liftoff, thousands of Kilograms of water are being poured over the launch platform to suppress the acoustic loads at ignition & liftoff. Launch Vehicle Ordnances will be armed at X-30 Seconds and the Guidance System of the Vehicle is being switched to Flight Mode 12 seconds later before the sparklers underneath the twin LE-7A main engines ignite to burn off residual Hydrogen. Ignition Sequence Start is commanded at X-5.2 Seconds and the twin LE-7A Engines soar to life as the turbopumps spin up to flight speed being monitored by on-board computers to make sure the powerplants are healthy before the point of no return – the ignition of the four Solid Rocket Boosters. Climbing from its launch pad on the southern tip of Tanegashima Island with a total thrust of 1.2 million Kilogram-force, H-IIB will ascend vertically for only a few seconds before pitching and rolling onto a south-easterly trajectory, aiming to drop the HTV off in the orbital plane of the Space Station. The four SRB-A3 boosters – each generating 235 metric ton-force of thrust – will burn through 66 tons of propellant in just one minute and 54 seconds, accelerating the rocket to a speed of 1.9 Kilometers per second. Their declining chamber pressure will trigger the onboard computer to drop the boosters in pairs at T+2:04 and T+2:07 at an altitude of 65 Kilometers, ensuring the SRBs make a safe off-shore impact. Powered by its twin LE-7A engines, H-IIB will continue towards orbit with a total vacuum thrust of 224,000 Kilogram-force, dropping the 15-meter long payload fairing halves three minutes and 40 seconds into the flight when passing through 120 Kilometers in altitude. Main Engine Cutoff is expected five minutes and 47 seconds after liftoff followed seven seconds later by the separation of the 38-meter long core stage. The second stage will fire up its LE-5B main engine one second after passing the T+6-minute mark, starting out 194 Kilometers in altitude and at a velocity of 5.6 Kilometers per second. It will be up to the 14,000 Kilogram-force LE-5B to heave the cargo craft into orbit via an eight-minute and 19-second engine burn. 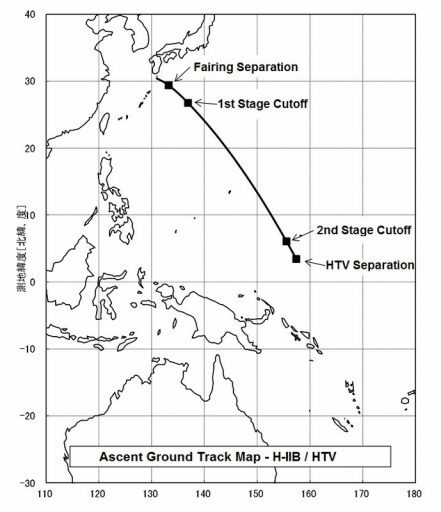 HTV-6 is aiming for an insertion orbit of 200 by 300 Kilometers, inclined 51.6 degrees with spacecraft separation expected 15 minutes and 11 seconds after liftoff. Starting out in a lower orbit than ISS, HTV will be tasked with a series of maneuvers to raise its orbit and chase ISS down from behind and below to arrive in the direct vicinity of the Station on Tuesday for a robotic capture around 11 UTC. HTV-6 is booked for a five-week stay on the Earth-facing port of the Harmony module to facilitate a busy mission inside and outside the station. Plenty of internal cargo has to be moved by the Station’s crew while on the outside, Canadarm2 and the Dextre robot are in action to retrieve the battery replacements and get started with the removal of the old units. Astronauts Shane Kimbrough and Thomas Pesquet are expected to venture outside on January 6 and 13 to install the adapter plates and Li-Ion batteries. 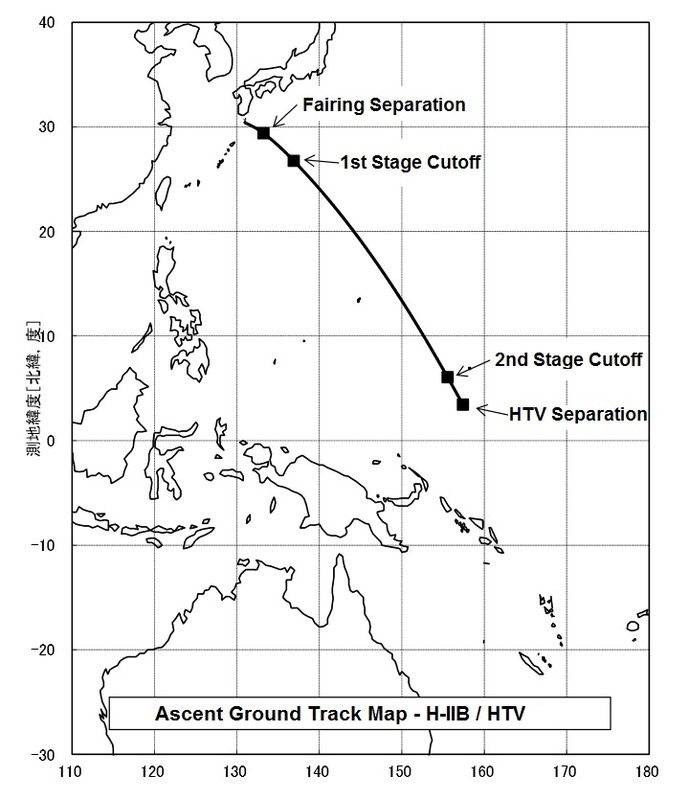 If there are no hold-ups with the complex battery replacement, HTV-6 will depart ISS on January 20 to head off on a week-long free flight dedicated to the HTV-KITE experiment that aims to deploy a 700-meter electrodynamic tether from the HTV spacecraft to study a possible method for removing space debris from orbit.